I'm trying to setup my guitar to run through my desktop monitors. I tried running the amp direct out into the speakers, and it works, but the sound isn't very good. It seems muffled and distorted, even at lower volumes. Is this a known issue, or is there a setting to change? Also, if this isn't a good setup option, what would you recommend to use? I looked at getting an HD500X, then run that into the speakers, skipping the amp all together, but figured I'd try with what I have first. Instrument Level signal going out into a Line Level signal input device. Thanks. That's what I thought might be the issue. Would I have this same problem running an HD500X into powered speakers? Need some pre-amp as a buffer amp in between. The Line Out/headphone out from a Spider 4 75 is not instrument level. khawkins75 - what speakers did you hook up? The solution above ^^ is taking the powered speaker output and paralleling it to more devices. Note that this could affect the amp's output circuit (running a parallel circuit will reduce the impedance seen by the amp circuit). It's also sending a powered signal to whatever device is being used - this could blow out components in an audio interface or computer's audio input. 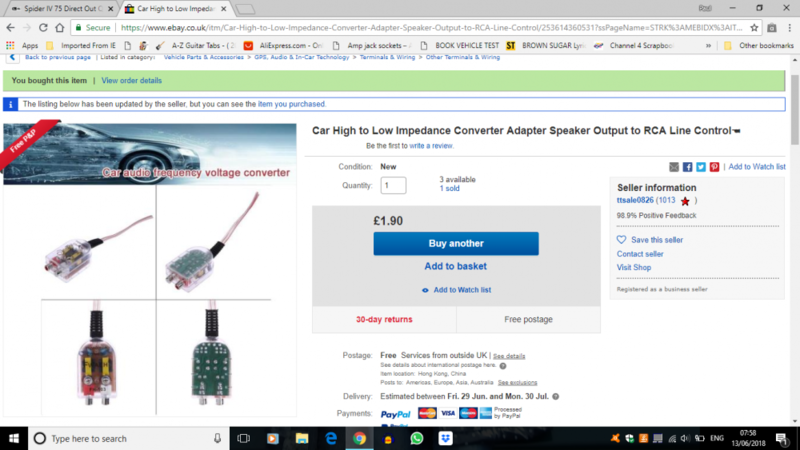 Not sure why the OP wants to hook up desktop speakers directly to the DI - the amp's built-in speaker will give the best tone.